• Once surgical procedures are completed and after full recovery from anesthesia, animals are	discharged from the clinic the same day as surgery. Dog Discharge is typically from 2-4pm. Cat discharge is from 4-4:30pm. • We will review the After Surgery Instructions with you. You will be told what to expect over the next few days as your pet recovers from surgery. • You will be told of any conditions or medical issues the veterinarian may have found during examination which may require follow up at a full service veterinary clinic. • Your pet had major surgery with general anesthesia, which means he/she was unconscious during the operation. • In female dogs and cats, the uterus and ovaries are removed through a small incision in the abdominal wall. • In male dogs and cats, the scrotum is not removed, only the testicles. Male dogs have an incision just above the scrotum. Male cats have two incisions, one in each side of the scrotum. Male cats may appear as if they still have testicles. This is normal – the swelling should subside gradually through the recovery period. • Make sure your cat has a comfortable spot to sleep in a confined, secure, quiet place. Once she's settled, she's likely to sleep it off and will be fine upon awakening. • We provide 24/7 aftercare. If you have concerns, call the 800 number provided at check out. 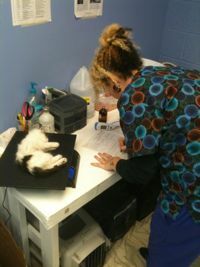 We are not responsible for vet care not authorized by one of our staff through our documented aftercare system. We cannot be held respoinsible for complications resulting from failure to follow post-op instructions, or for contagious diseases for which the animal was not previously properly vaccinated. • If animal allows, check incision site once daily for one week. Check for excessive redness, swelling, discharge, blood or if incision site is open. • Do not clean or apply any topical ointment to the incision site. If concerned please call the 800 number provide at check out. • Sutures will dissolve and may create a swelling 7-10 days after surgery. • Unless you are told otherwise, your pet does not have external sutures. • Male cats do not have any sutures. • All sutures are absorbable on the inside. The very outer layer of skin is held together with surgical glue. • If you are told that your pet has skin sutures or skin staples, he/she will need to return in 14 days to have those removed. Please come in between 10am - 2pm to have staples removed, you do not need an appointment. • All female cats, female dogs, and male dogs receive a small green line tattoo near the incision line. • This is a universally recognized tattoo that identifies your pet has been spayed or neutered. • Tattoos are generally not placed on male cats. • You need to re-introduce food slowly. Offer a small amount of water 2-3 hours after leaving. If successful offer small amount of food 1-2 hours later. Your pet should be back to a normal diet the day after surgery. • No running, jumping, playing, swimming, or other strenuous activity during the 14 day recovery period. • When outdoors dogs should be on a leash and taken for short walks only for next 14 days. • Non-feral cats should be kept indoors for the next 14 days. Spay Oklahoma will re-check your pet at no charge at our clinic for any complications resulting directly from surgery. There may be a minimal cost for medication if needed (such as antibiotics) or an e-collar (cone of shame). Spay Oklahoma cannot be held responsible for complications resulting from failure to follow post-operative instructions or for contagious diseases in post-operative period. Your regular veterinarian must address illnesses or injuries that are not a direct result of surgery.